The 1236 had it's single biggest growth day today. The 1161 had one of its slowest weight-gain days in the last 5 days. On the same number of days it is only 1 inch behind the 1236 but it doesn't seem to have much umph in it the last few days. Wondering if I stepped on the main vine or something when trying to get all of the sucker vines. I'm hating the sucker vines lately. Gave both plants some CO2 and compost tea with fish & seaweed mixed in. The kids and I did the 10 day measurement on the 1129 Orleck they are growing today. They have been doing a good job of watering it and feeding it leaves (my 6-year-old daughter feels strongley that leaves are the key to a big pumpkin--and she might be right). After the kids pumpkin was devestated by a big hail storm last month it has come back into shape. On day 10 their 100 square foot plant had a pumpkin that is 23 inches which is bigger than my day 10 measurements on either of my pumpkins. I really debated if I was going to keep this plant for myself. It was a really great looking plant when it was in the pot and then it took a bit of a nose dive I decided not to grow it myself. It was growing like a champ until the storm hit it and it looks very nice now except it is small because it basically had to regrow all the leaves and half the vines over again. This pumpkin should go heavy to the charts. It's brother was 20% heavy. I crossed it will the 1161 Rodonis so it should have some good, heavy genetics in those seeds. The first two pictures are of the 1161 Rodonis and the second two are of the 1236 Harp. The Harp is much bigger but four days older. My wife was griping today about a lack of pumpkin pictures. Usually she gripes about me going to the patch but today she gave me my camera and sent me over the fence to take some snap shots. These will be my last pictures until the patch tour. Growth for both pumpkins has been a touch slower than expected for the last few days. Particularly for the 1161 plant. They are both still on the low end of exceptable but I was hoping for more of a ramp up at this point. I knew the leaf damage would slow things down, but I was hoping for more. I grow my pumpkins on sand so there is good drainage under the pumpkin and so the pumpkin can slide as it grows. It's always fun to see a mound of sand on the edges of the pumpkin because then you know it was growing that day. I noticed a very slight split that had healed on the blossom end of the 1236 pumpkin yesterday in a rib. Don't like the spot it was in at all. The good news is that it seemed dry and healed so it was probably just a growing split which are not a big deal. The 1161 had some similar very minor splits on the stem. I put a touch of diluted bleach on both and will be watching them (and praying). My web design business has been very busy for the last three weeks and it is taking a small toll on the plants. Yesterday was the first time I've spent any significant time with the plants in a week. Most of the time was spent getting sucker and tertiary vines cut out of the jungle. I took things up a notch today with my fertilizer program. I feel like I'm not getting everything I could out of my pumpkins and after talking to a couple of great growers I poured it on today doubling the amount of fertilizer that I would normally give to the plants. Today's gains were slightly above normal for the 1236 and below normal for the 1161 but neither of them are giving the bigger gains that I would expect from them at this point. The extra fertilizer is an experiment to see if a nutrient issue is what is holding the pumpkins back a bit. I heard from Nick Harp today. I had asked him if the 1725 just jumped in growth after day 30 or if it just never slowed down. At this point in the season last year the 1725 wasn't doing much. His response was, "the 1725 took off after day 30, or rather didn't slow down much." Gave both plants a tablespoon of fish & seaweed along with 1/4 cup of of Fox Farm 3-4-3. I was walking by the 1236 pumpkin this evening and I noticed something I have never seen in this pumpkin before. Daddy! To this point I've seen a lot of the 1236 mama, mostly in the orange color. But today I saw something forming in it's shape that hasn't been there before. The 1725 shape. Almost exactly. Below is a picture of the 1236 superimposed on the 1725. Outside of the widest part of the shoulders the outlines of these two pumpkins is almost exactly identical. The slope down to the shoulders, the ribbing, almost everything (except for the size) is nearly exactly the same. I think this is a good thing. The 1161 grows almost identical to the 1236 every day. Not loving the sucked in blossom on this pumpkin. Did a compost tea drench around the stumps for both plants today. 30 day measurements are usually considred important because it is right in the beginning stages of big growth. Often you know if you are a contender by the 30 day mark and then over the next three weeks you find if you were a pretendar. Lets say I'm pleased but not thrilled with my 30 day measurement. If your name is Joe then you might understand what 100 means. The picture below is the 1236 Harp. At the same number of days the 1161 measures a little bigger but the 1236 has such a square shape that it looks a lot bigger. A very pretty pumpkin at this point like the mama. Leaf fungus is under control right now. I'm concerned that the beating the leaves have taken will effect the growth come September so I'm hoping to pack on as many pounds as possible before then. I gave the plant some fish and seaweed yesterday along with some CO2. I've failed to mention on the blog how the kids pumpkin plant is doing. It was hit in a big hail storm really bad a month ago but as of two weeks ago you would have hardly known it had happened unless you looked really close. The kids would have had a pumpkin set on the main vine three weeks ago but they lost three feet of the main in the storm and 90% of the leaves so the plant has been busy growing back. They now have two nice pumpkins on the plant. If the 2nd pollination (1129 Orleck x 1161 Rodonis) that was done on Monday takes then theywill go with it. the 1st pollination is growing very nicely and I love the semi-long shape these pumpkins have. I think this is a very good cross that should go heavy. The kids personal best is 85 pounds and I would be suprised if they don't have that beat within a month. 250 pounds for them this year might be a real possability. I checked the stumps today on both pumpkin plants and found a problem with the 1161 plant. There was the very beginnings of some rot around the base of the stump. I cleaned up the area, pulled a touch of dirty from around the stump, cleared out some leaves in the area of the stump so it could get more sun and put on a 30% dilution of bleach to kill whatever is eating at it and then patted it dry. This year has sure been a battle. My first season was nearly trouble free except for some minor hail damage. If I can have a pumpkin to take to the scale at the end of the season it will be called a success. Looks like my leaf problem is Angular Leaf Spot according to Dr. Matt DeBarrco. From everything I have read I have to concur with his diagnosis. There are a lot of things that look like what I have but the rate of deterioration and the look of the holes in the leaves it all seems to match. Most of the leaves I have lost on the 1161 were the leaves that were damaged in the hail storm. Angular leaf spot likes damaged leaves. Today I didn't seem as much new damage on the leaves as I have the previous days. I think the hail damaged and old leaves got taken out and the rest of the leaves that are healthy are holding on for now. I ordered good fungicide by the name of Phyton 27 today that I will hit the plants with when the weather cools down on Monday. Growth on the 1236 was slower today but the 1161 hit a new personal best for one day growth putting on 6.5 inches today. I gave both plants some compost tea with some fish & seaweed and a pinch of blood meal added this evening. Also gave both plants some worm castings from my worm bins. Vine growth has been a little slower than I would expect right now so the pinch of blood meal in the compost tea was to help push them along a little. I recognized yesterday that the leaves were having some problems. Some big problems. A little over a week ago I saw what I thought was some leaf burn on the plants. About 5 days ago I noticed that some of the older leaves had gone dull and then a day or so after that I saw that the "burn" on the edge of the leaves was progressing rapidly. I now recognize that the burn is some kid of fungal infection. Both plants have it and I'm loosing about 5-10 leaves a day because of it. All of the leaves on both plants look a little dull from it. Now the battle is to keep the plants healthy enough to get a pumpkin to the weigh-off. No state record for me this year. I'm hoping to just get some viable seeds out of the pumpkin. Besides all the troubles, the 1236 did it's biggest single day gain of 28 pounds today. It is right in it's growth cycle now so hopefully it can work through it's problems and keep growing. I sprayed some fungicide on the plant to try to slow down what is going on but I don't even know what I have. Been doing lots of research but haven't been able to figure it out yet. It's going to be close to 100 degrees today and highs in the upper 90s for the next 5 days. All of this week has been hot and it has effected the pumpkin growth. Good growth at nigth and not much growth during the day. Running the misters hard to try to keep the leaf burn down but the older leaves are taking a bit of a beating the last few days. This first two pictures are of the 1236 and third one is the 1161. I may not win 1st for heaviest pumpkin but the 1236 could give me a shot at the Howard Dill Awared for prettiest. I'm still pushing for big however and both plants just might have enough to do it. 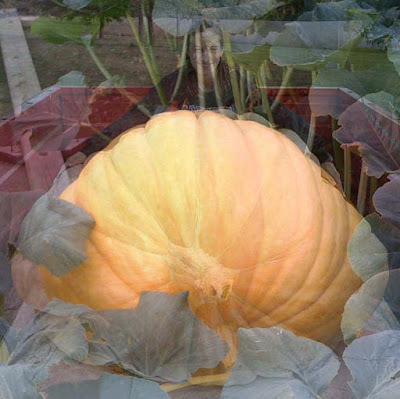 The world record 1725 pumpkin at day 31 was at 115" which actually isn't all that big. My goal for the 1236 plant is to equal that and it has a shot at it. 6" a day for 9 days and it will make that goal. Right now the 1236 is in the zone of rapid growth that usually kicks in between day 20 and day 30 (Joe reminded me yesterday that it is usually around day 23 when it starts). It is in this window and then September that seasons can be made and lost. 30-40 pounds a day is not uncommon. It is the pumpkins that can sustain that growth that typically end up doing the best. Gave the pumpkin plants some compost tea this evening with 2 tablespoons of seaweed mixed in. The 1161 finally showed some descent growth for the first time. The 1161 finally matched the 1236 for inches grown in a day. I think it might finally be waking up. After terminating vines like crazy over the last three days I think it is getting the message and putting on the pounds. It is going to be very hot over the next 5 days. Gave the plants some CO2 to help them with the heat. It will be interesting to see how the pumpkins do with the heat. Will be running the sprinklers a little longer during the plants regular hourly misting. This Might Just Be the Greatest Movie Ever Made! Pictures to the right is the 1236 Harp pumpkin. The pumpkin is much more of a dark yellow than the picture shows. Grew a solid 3 inches overnight. I think it must have it's papa in it. It you look close enough you can see my reflection in that pumpkin because of all the shine in it. Second pictures is of the patch. Lots of leaves. Would like to see some pumpkins popping up over that canopy soon. I've come up with the names for my pumpkins this year. The biggest one is going to be RedemptionBoy and the second one is going to be LarryBoy. As you may recall last year's was HailBoy and the year before that was DillBoy. 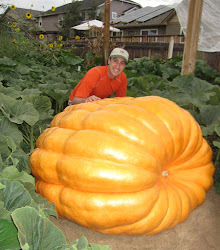 DillBoy was named in Honor of Howard Dill, the "inventor" of the Dill Atlantic Giant pumpkin. Last year's was named because of the hail storm that took the plant and pumpkin out. RedemptionBoy is going to be named because hopefully I can have a pumpkin this year that will redeem the previous year's disaster. LarryBoy is a bit of an inside joke. We have some good family friends whose oldest son is name Larry. He is three months older than my son but at 9 months old he was nearly double the weight. It wasn't an unhealthy thing as much as genetics with this kid, but frankly his parents would say he was fat in every direction. I'm hoping to have a Larry pumpkin this year. Went to the Shenfish, Wiz and Biz patch last night with Joe. All of their plants are looking healthy and the pumpkins are growing big. Shenfish has a monster growing on his 1544 plant that is a wheel. Didn't see Joe's pumpkins, but he mentioned that he has a bigger pumpkin on his 1544 plant than what the Wiz and Biz have. Glad I got some pollen from Joe to pollinate the 1161 with. A lot of growing season left to go however. Did lots of vine burying this morning. Between illness and rain I had done very little work in the patch this last week. The ground is still fairly wet. I didn't see official numbers but I'm guessing we got about 1 3/4 inches of rain between the 4th of July storm and the mid-week storm. The plants seem good however. When it comes to pumpkin growing a lot of it is timing. There are a lot of hormonal things that go on inside a plant. Surprisingly a lot of the chemical reactions inside the plant are the same as in people. When it is time to start pollinating pumpkins you see the effects of these hormonal changes in the pumpkin in the form of flowers. Sometimes, as growers, we have our own timetables that aren't necessarily the same as the pumpkins. The last week of June we like to pollinated pumpkins but that isn't always what the plant wants to do. Weather, stress, nutrient deficiency, to much of a certain nutrient can throw the hormonal balances off. As pumpkin growers, there are things we can do to help manipulate these balances and move things in the direction that will help with pumpkin growth. Where the nutrients in a plant flow is called a sink. In early June the vines become a sink and as a result you see vine growth of a foot a day or more. In early July you want to transition the sink to the pumpkin. The best way to do that is to have your first side vines out to the edge of your pumpkin patch by the first week of July so you can terminate them. By doing so you start to transition the sink from vine growth to pumpkin growth. My 1161 right now is in that transition. The first side vines were terminated the third week of June. The next week the next set of side vines were terminated. As of today about 75% of the side vines are terminated. This should be forcing the plant to put more energy towards the pumpkin and I have seen some improvements in growth from it. But with all of the rain we just had the plant is having a bit of a hard time getting out of vine growing mode so I have been seeing a bunch of tertiary vines popping up. I must have taken off 20 tertiary vines this morning inside the 1161 plant. The 1236 plant however is not seeing that kind of an issue. The pumpkin is growing very nicely and conversely I took off maybe 3 tertiary vines today. Eventually what should happen is that there will be very few places for the 1161 plant's energy to go so most of that energy should start flowing to the pumpkin and watch out when that happens. Right now the 1161 and 1236 have less than 20% of their growing space remaining and I suspect that both plants will be completely terminated by the end of July. I predict that what is going to happen is that around the fourth week of July the 1236 pumpkin is going to be ahead of the 1161 pumpkin but by the beginning of the 2nd week of August the 1161 will pass it and end up being the bigger pumpkin. No way to know for sure when one is gonig to turn out biggest, but looking at these plants that is what my gut is telling me. I hope they both turn out to be monsters. Cool weather in the 60s with lots of rain in Denver the last couple of days has definetly slowed down vine growth but the pumpkins haven't seemed to slow down with inches being put on both pumpkins during the night. Growth rate of both pumpkins seems pretty acceptable now. I'm going to have to change my covering for the 1236 very soon because its almost outgrown the available space. At each leaf node on a pumpkin plant roots will grow out of the top and the bottom of the vine if you bury them. It is a lot of work burying vines but it pays big dividens at the end of the season. I had to remind myself today to cut those roots that are next to the pumpkin because as the pumpkin lifts up as it grows they will hold the vine down and you can end up with a problem. The 1236 grew two inches since I measured it at 8:00 last night and I noticed the vine wasn't lifting up at all this morning. There were some nice big roots on the nodes under and next to the pumpkin. One of the tap roots was a really nice cluster that was probably 6 inches long and 1/2 inch thick. The 1161 saw some good growth last night too. First big movement I've seen on this plant so far so maybe it is finally making the pumpkin a sink or maybe the 1/2 inch of rain that fell last night helped push the pumpkin along. Cool weather today, tomorrow and Friday is in the forecast for Colorado so it will be interesting to see how the pumpkins react. Like I've said previously, neither of my two pumpkins are growing at amazing rates so far but we are so early in their growth it doesn't matter to me at this point. It is the 3 weeks that the pumpkins are in rapid growth stage and putting on 30-40 pounds a day and the month of September that makes or breaks a pumpkin. The first picture is of the 1236 Harp pumpkin. It looks like this one is going to be a dark orange like it's mama. The 1161 is a slow poke right now, but I just took off the pumpkin at 9' today so I hope it will start picking up the pace. The pumpkin at 9' had the start of some orange coming through around the stem so it looks like this plant is going to produce orange pumpkins too. The pumpkin that I took off is super solid so I'm hoping I got the heavy gene in this plant. It also had a super thick stem. Both pumpkins are bowling balls at this point. I gave the plants some compost tea with about 1/8 cup of fish & seaweed added last night. Did the 10 day measurement on the 1236 Harp today and it is officially the largest 10 day measurement I've ever had. That doesn't say much however. I've never had a big 10 day measurement before. Just 1,298 pounds left to go this season! No barn burners but I have pumpkins at my choosen positions on both plants now. It looks like both pollinations have taken. Now we will just have to wait to see if they keep growing. The pollination on the 1161 at 13' is 1161 Rodonis x 1544 Revier. Pollination at 11' on the 1236 is 1236 Harp x 1161 Rodonis. First picture is of the 1236 Harp and second picture is of the 1161 Rodonis. Not sure if the latest pollination on the 1161 is going to take. Pumpkin hasn't laid down yet and it hasn't seemed to grow much. It is still shiney and it has a very thick stem so it might just be holding it up. The 1236 main vine self terminated this week due to the heat. I noticed on Wednesday that the vine tip looked a little crispy but it still had some green and today it was completely dead. The good news is that it was only about two feet from where I was going to terminate it anyways. This plant's main is the fastest I've ever had and the combination of the heat and a root structure that wasn't very estabished this far out burned it up. I should have had the vine tip covered. Gave the plants some CO2 yesterday to help them deal with the heat.